The bogus FM switch-off: Will you budge? Andrew's Mailbag So contrary to reports, we're not going to have an "Analogue Switchoff" - and 150m good radios won't stop working overnight (or merely be able to tune into static, plus a very local low-power FM station). Just a quick comment - can't see there being a switch off - well to DAB at least - I'm sure it won't be long until internet / wifi radio ousts DAB (even a 3g/Edge receiver for the car radio's). As much as I like it, don't think DAB has a future. I like your analysis of why, logically, you should not switch off the analogue radio signal in 2015. The problem is, there are a load of vested interests, ranging from the BBC with its push for digital, to the radio manufacturers who want to sell the kit, and of course the political establishment who want to "do something" and need a "big idea", who all want an analogue switchoff for their own reasons, and who are not open to logical argument. Radio is essentially a very intimate medium, one you can take with you as you move about. I have about 8 radios I use regularly, including the clock radio that wakes me up, the hi-fi, several portables around the house, the car radio, and the small ones I take on holiday or to the cricket. Replacing these with digital will be expensive, and some can't be replaced, as digital sets are basically not portable enough. I have several computers but don't listen to the radio on them as I can't carry them about, and the same goes for the digital TV which can in theory give me digital radio as well but only in the room it's in. Both computers and TVs are also expensive to run of course. Even if I had a DAB radio I don't think I would use it much as it would only be in one room of the house. So I'm quite pleased that there is a bit of a fuss and I hope it develops into a big campaign as it's the only thing that will stop this madness. Libby Purves took a ferocious blast at the "switchover" logic last Sunday in the Times, here. If you can ignore the obligatory climate reference (she's at the BBC, remember) she makes a good case for leaving things where they are. F*ck this lo-fi bandwidth constrained DAB bullsh*t.. Move on to DAB+ or remove stations and increase the bit rate. I believe most of Pure technologies DAB stuff supports +. "To ensure, as much as possible, that any additional digital upgrade will have a minimal impact on listeners we will seek to ensure that all digital radio receivers sold in the UK meet at least the WorldDMB profile 1.17 One way this could be achieved is by clear labelling such as the ‘digital tick’ used in Digital TV Switchover." This WorldDMB Profile 1 makes the support for DAB, DAB+ and DMB-A compulsory. Any radio that supports Profile 1 will work in the UK on DAB, in most other European countries on DAB or increasingly DAB+ and in France on DMB-A. The economies of scale are finally here. Not in the least because DAB+ is also seeing uptake in Australia, Egypt, Malaysia and possibly China to name just a few. France makes Profile 1 compulsory in cars from 2012 so expect all brands that either originate from France or are sold in France to have a Profile 1 compatible radio on board. That basically covers about all new cars on the market in Europe. That just leaves the existing cars with radios that don't support any of the Profile 1 technologies. However, there could well be a tipping point somewhere in the future where broadcasters will consider broadcasting on DAB (DAB+ if Ofcom finally has the balls) a given and FM the nuisance. Where that point will be is unsure but for pure commercial broadcasters it will probably be around the 50% DAB uptake mark, for broadcasters with a mission like the BBC that may be around 90%, the rest somewhere inbetween. Good article. I'd certainly got the impression from the general press that come 2015 I'd be having to chuck out all my radios and get DAB ones. No doubt I'm not the only one to note the distressing lack of any widespread acknowledgment that a technology such as Digital Radio Mondiale (DRM), or more probably DRM+, would be an obvious choice to solve both the broadcaster's and listener's problems. It's transmission costs are lower, which suits the broadcasters, and its reception performance is far better than DAB, which suits the car driving listener. I think that the broadcast radio world in general would be well served by ditching DAB forthwith, waiting for DRM+ to mature, but certainly plumping to DRM straight away. Also sadly lacking from any future gazing is a general acknowledment of the reality of HD Radio that you have in the US. Although slightly different to DRM, it is already there, and is clearly a better technology than DAB. I don't understand how anyone can stand up and say that DAB's 'the way to go' (and your point that Carter doesn't actually say as such is very interesting). Such an assertion smacks of someone (i.e. UK gov) in a desparte hurry to cement a position before its ridiculousness is apparent to all. I think UK gov is badly misreading the situation. Given what's been going on over here in recent weeks I don't think that anyone would notice, or even care, if the government changed its mind and backed DRM. It would be far easier to abandon the investment in DAB than it would be to persuade people / broadcasters to buy into it wholesale. In constrast it would be very easy to persuade them to buy in to DRM as it offers real tangible benefits to all. Saying now that they're abandoning DAB in favour of DRM by 2015 wouldn't be too damaging either because there's hardly anyone out there who would really care about DAB's demise. Also 2015 is far enough away that those who have got a DAB radio would probably judge that they've had their money's worth by then and would probably relish upgrading to something better anyway. Our next correspondent, from DAB industry group the Digital Radio Development Bureau thinks we're bashing DAB. There have been a lot of critical comments on the radio side of Digital Britain in the media, although perhaps not as negative as you would like them to be, e.g. John Plunkett wrote a fairly critical piece in the Guardian. Channel Four did not pull out of their DAB plans because of ‘carriage costs’ or ‘low audience figures’; where is your evidence to suggest that? Where is the ‘slippery distinction’? Both the DRWG and Digital Britain reports were open that the digital listening target would include DAB, digital TV and internet, although there is the reasonable assumption that DAB will be the lion’s share, at least in the short to medium term. Ofcom research actually shows that there are 40-45 million radios in use (at least once a week) excluding cars, and that includes the 9 million DAB receivers. DAB sets are now in a third of households – not quite the picture you portray in your article. You say ‘Britain's strange insistence on maintaining its own flavour of digital radio deters manufacturers’. There are actually over 300 DAB products in the market, from a wide range of manufacturers. For example, this year alone Sony are bringing out 19 new DAB receivers. In fact all the digital radios that will be sold around Europe, including France & Germany, will work in the UK, and probably from the middle of next year all the digital radios sold in the UK will work there as well. There are your economies of scale. Your graph on cars assumes that the only way to get DAB in car is get one factory-fitted, when that is not true. The Pure Highway is already available, but is only the first of its kind, so there will be a wider range of cheaper, better adapters coming out in time. Car manufacturers like Ford & Vauxhall (who still make 6 of the top 10 best selling cars in the UK) have announced their support for standardising DAB by the end of 2013, and in fact any manufacturer selling cars in France will have to standardise digital radios (which will work in the UK) by 1 September 2013. Tony Moretta Chief Executive Digital Radio Development Bureau. I think one of the major problems is the anticipated pressure on the BBC to migrate their national stations off FM. I retired a DAB radio shortly after purchase as the quality is so bad, it is difficult to use and reception is prone to interference. Tens of millions of portable analogue radios, many of which are just used usually to listen to BBC Radio 2 and Radio 4, will become useless if these channels migrate to digital only. Radio 3 is unlistenable on DAB without headache tablets. 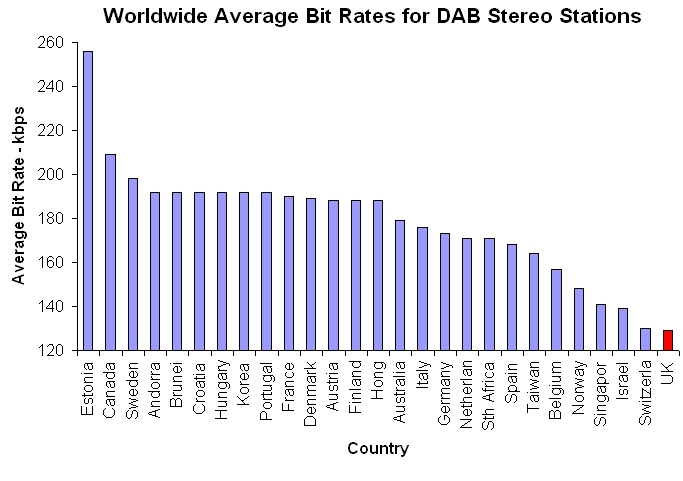 All hifi tuners, often very expensive, will become landfill also relaced by awful DAB (not plus) ones. TV set top box radio is of course currently better (freeview). One can only presume that the writers of the report either have cloth ears or did not bother to compare the quality or did not care. The fact that FM would remain for currently unpopular or new local FM stations does not change the problem of the quality national broadcasts. I would suggest that the government wants "switchover" to make more money from licences, manufacturers so they can sell more DAB sets made in the far east and DAB broadcasters so they can force listeners to use the expensive service they have invested in. The BBC national listener should however, I submit, not be forced to give up a cheap-to-buy, convenient, reliable, familiar, high-quality and reliable analogue system in favour of an obsolete (basic DAB), interference prone, poor quality, expensive piece of junk.